Niccolo (Nicolas) Paganini was a famous Italian violinist and composer of the 19th century. He was one of the most admirable virtuosi of his times, and still he remains among the most influential musicians ever, with absolute musical abilities and talent in composition. Besides, he is considered to be a revolutionist in the art of playing violin due to his innovative approaches to performing, unique uses of harmony and such techniques, as staccato and pizzicato. Niccolo Paganini was born on October 27, 1782, in Genoa (though some sources inform that he was born on February 18, 1784). He was one of six children of Antonio and Teresa Paganini. Father of future violin genius, a former dock-worker and a keen amateur performer on the mandolin, was a very despotic and authoritarian parent. He was raising his children in cruelty and severity. At the same time, Niccolo was a weak and sickly child, who suffered a lot from various complications with health after an attack of a hard measles in very early age. When he was five, Niccolo started receiving musical lessons from his father: firstly on the mandolin and, later on, on the violin. Antonio used to force his son to practice hours and hours, giving him practically no time to rest or relax and punishing little boy ruthlessly for every little mistake. Therefore, very soon Niccolo’s native abilities for playing supported by this forced practicing started giving fruits. 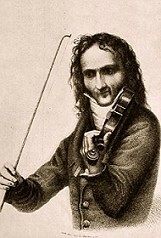 Young Paganini was improving his playing every day, and in 1791, at the age of nine, he was accepted to local theater orchestra of Giovanni Servetta. He continued his lessons under the guidance of Francesco Gnecco (harmony) and Giacomo Costa, maestro di cappella of the Cathedral of San Lorenzo. His first public performance took place in May 1794 in the Church delle Vigne di San Filippo, where he played the Concerto of Pleyel. It was followed by a number of concerts in churches of Genoa, and the success of young performer was phenomenal. By that time Niccolo has already started doing his first experiments in composing and completed his first sonata for violin. In 1795, for the money he collected from the concerts, Niccolo was sent to Parma in order to ask for lessons from a famous violin specialist, Alessandro Rolla. After listening to inspired performance of young Paganini, Rolla was overwhelmed and refused giving lessons to Niccolo, saying that there was nothing to teach him. He referred Niccolo to other known Italian composers, Paer and Gasparo Ghiretti, who were also, in turn, enchanted with Paganini’s colossal talent and could not offer him some serious material to be mastered. Having received freedom from father’s cruelty and control, Niccolo was not in hurry to return home. He spent about a year, traveling around northern Italy and giving concerts in such cities as Milan, Bologna, Leghorn, Florence, Pisa and others, leaving everywhere hundreds of spectators truly impressed with his divine performance. It was perfect time for 15-year old boy to be seduced out of the right way by own success and fame, and Paganini started looking for entertainment in drinking, spending money on women and especially gambling. But, after being back to Genoa, Niccolo Paganini entered a period of the hardest work and most exhausting practices in his life. Historians report, that he was usually playing ten-fifteen hours a day, combining his practices with composing, and rarely giving some private performances. In addition, he was spending a lot of time and efforts to master and improve his playing guitar, as well as to achieve progress in composing for this instrument. For about four years Niccolo together with his family has been moving around the Toscana, polishing his playing techniques during rare concerts and long days of rehearsals. In 1805 Niccolo Paganini returned onto public stage and started a lasting tour around Europe, where he appeared in front of public with numerous brilliant performances. For the years of practicing in seclusion, he prepared original conceptual shows for his audience, which included striking performance by memory, accompanied with theatric movements and elements of pyrotechnic, playing on one string, etc. He visited many countries in Europe, and enormous success was waiting for him everywhere. In free time he acted as music director and court violinist to Napoleon’s sister Elisa Baciocchi, Princess of Lucca and Piombo. Unhappy with being employed and having some responsibilities to Baciocchi, Paganini broke the agreement and became freelance soloist with tones of own compositions. In 1813 he started an extensive tour around his own country, with an amazing debut in Milan. He concertizes for a couple of years, achieving great triumphs, enhancing his technical abilities and leaving his rival-violinists, like Lafont and Lipinsky, far behind. This tour made him a legendary violinist of national prominence, whose performance and techniques were truly unparalleled.